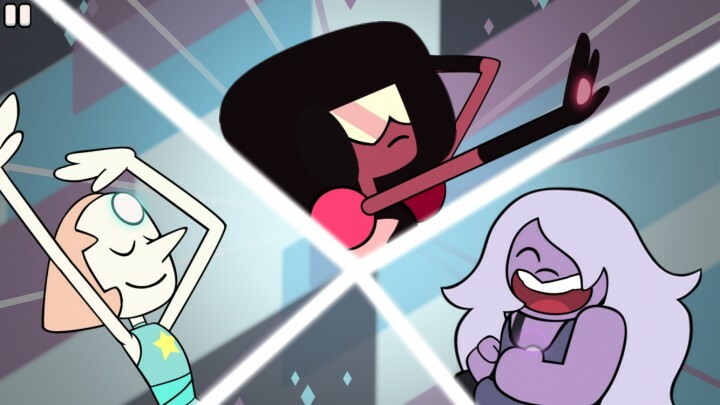 The amazingly popular (and rightly so) Steven Universe animated show has been condensed into a bite-sized super serving. Attack the Light! 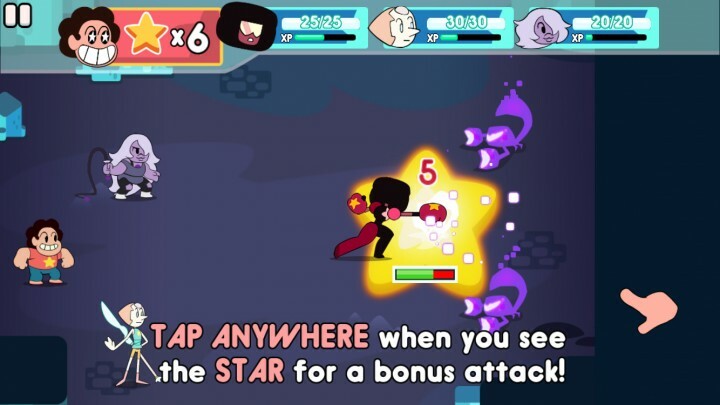 is a brilliantly executed iOS game that oozes with charm and a dedication to the show’s fans — but non-fans don’t need to be familiar with the show to enjoy it just as much. Reminiscent of whimsical RPGs like Paper Mario, it’s a very solid, well designed, and fun-packed adventure for anyone. It’s immediately clear that Attack the Light! was made with the fans in mind. 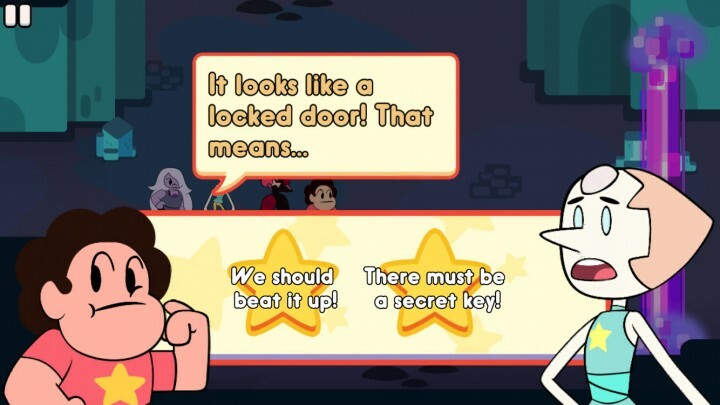 The game’s simplified art style and sense of humor are quite faithful to the show, with lots of references from many iconic episodes. In fact, the developers did a great job merging these references into items and abilities that make sense, like using the Cheeseburger Backpack as Steven’s inventory, or using Cookie Cats and Together Breakfasts as healing items. Everything has been designed perfectly for mobile gaming. The game is also built with portable play convenience. The adventure is split into stages for quick play sessions, with most not lasting more than a few minutes. Moving your team of Gems is intuitive with simple swipes, and menus are all tap-based; everything has been designed perfectly for mobile gaming, with no virtual buttons to clutter your screen. As for the battle system, you’ll find that it borrows quite a bit from the Paper Mario and Mario & Luigi RPG series, with good timing rewarded with bonus attack power or reduced damage from enemies. Attack the Light! also mixes in a few innovations too, like rapidly swiping the screen to build a combo, and aiming long-range attacks by pulling back like a slingshot. It also cleverly uses the health meter as a sort of power level, where you’ll need higher HP for stronger skills. This keeps being healed up important, since you can’t just spam your most powerful skills every turn. Finishing off the main gameplay features are a cute dialogue choice system and badges. 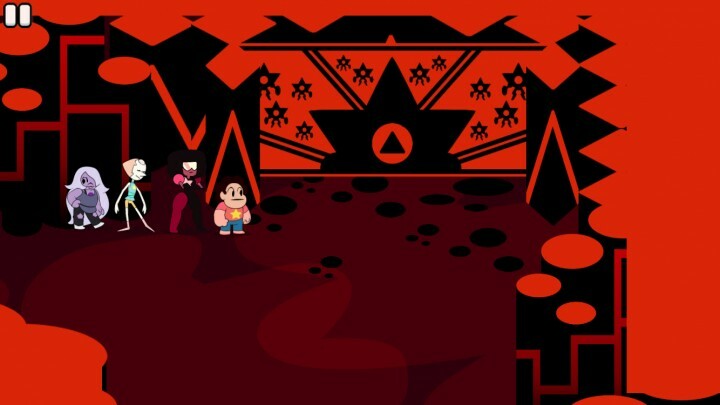 At various points the Gems will discuss what to do, and you’re offered a variety of ways to respond as Steven. For selecting the option that pleases your fellow Gems, you’ll get some nice bonus experience. Badges are the only form of equipment in this game, and they each add special properties that allow for a little customization of your party’s battle tactics. Attack the Light! kicks it up a notch with some more challenging content and added variety. After you beat an area’s end boss, you’ll get access to the Gauntlet for that area. 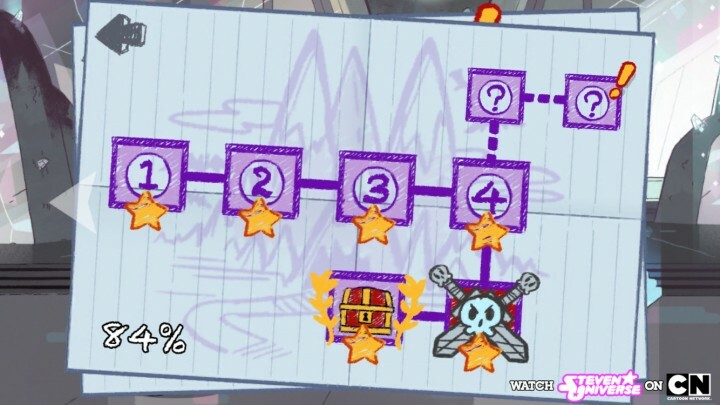 These are challenging detours that contain lots of bonus goodies, but you aren’t allowed to bring in any of your items. The enemies are a good bit stronger too, so battles feel more strategic and exciting — as long as you’re not overleveled. You’ll also start to come across some light memory puzzles, which makes you pay a little more attention than simply moving from screen to screen. Some of the solutions are kept in secret areas, which also hide extra chests and sometimes even shops with rare items. It’s easy to earn money quickly in Attack the Light!, so you’ll likely find yourself revisiting these shops often to stock up. For some extra oomph, the game adds fusing to your battle tactics. It’s an extremely powerful attack using the entire party that’s super flashy, with its own special animated sequence to boot. But, its requirements are pretty strict, needing both a full HP party and max stars (turn points). It can be useful for one-turn killing an easy group of monsters, but it’s mostly situational. I can’t deny the wow factor though — I found myself activating it sometimes just because it looks cool. 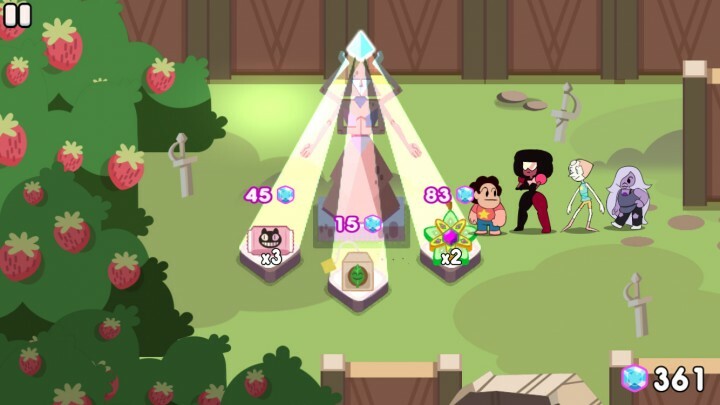 The game does a good job keeping every Gem useful. Even by the game’s halfway mark, the battles are still fun, with additional enemy patterns and traits like shields and flying/digging types. Attack the Light! does a good job keeping every Gem useful, with each of their skills being valuable in different scenarios. The whimsical sense of adventure is also still going strong, with plenty of vibrant areas to explore, items to find, and powers to unlock. I definitely wasn’t getting bored at any point. The final parts of the game don’t add too much to Attack the Light!. There’s a tiny bit of story inserted with brief snippets of dialogue and some background murals, but it’s nothing too fancy. Areas become a little trickier to navigate, with one stage literally made of nothing but secret rooms hidden behind walls. Enemies are also reused, so combat variety doesn’t change at all. By now, the game has shown you everything it has to offer, which makes gameplay slightly repetitive at the end. The final boss battle does have a small twist that goes a little deeper than “beat it up to win”, so that was a nice change of pace. But unfortunately that’s followed by a super short and lackluster ending that abruptly kicks you back to the main menu; I felt it was a missed opportunity to inject some of the show’s charm to wrap things up in a more satisfying way. It’s short and fun enough for at least one more go. After you’ve finished all of the stages, you’re done — there’s really not much replay value here. But, I suppose extra playthroughs can be attempted by building your party’s stats differently. 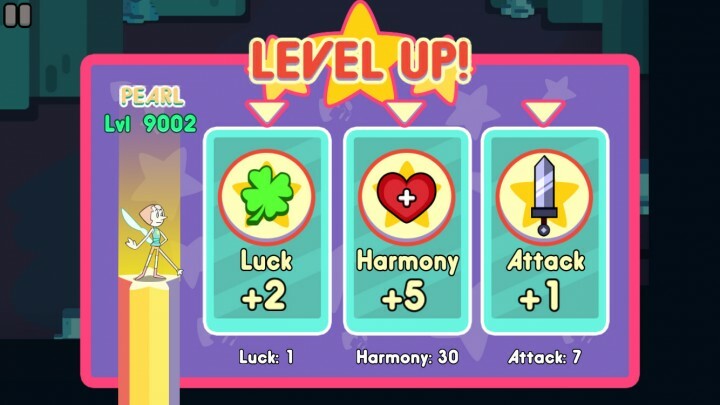 In my game I built Amethyst to have massive luck and equipped her with “on lucky hit” badge effects to quickly spread status effects. 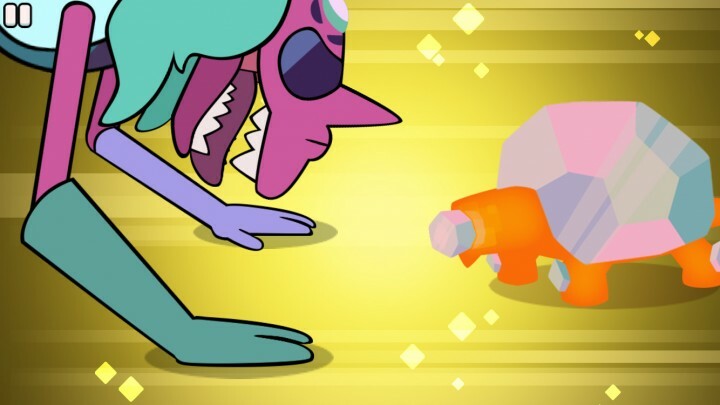 Garnet was just pumped full of Attack points with not much luck or defense — a sort of glass cannon. It might be interesting to reverse these roles, or try out different setups entirely for another go through the game. It’s certainly short and fun enough to warrant at least one more go. 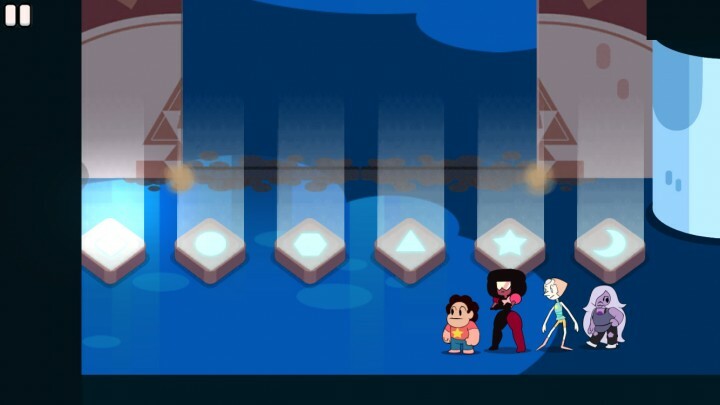 Steven Universe: Attack the Light! is a wonderful homage to the TV show, and an excellent standalone game as well. Everything about it feels crafted with care, and keeping fans — and RPG lovers — happy seems to be its primary goal. Well, I can definitely vouch for its success there as both a fan of the show and a diehard RPG player. But, even if you’re only one of the two, do yourself a favor and give Attack the Light! a shot.